Former Colorado Gov. John Hickenlooper said on Monday he's running for president, casting himself as a can-do uniter who's used to overcoming adversity and accomplishing liberal goals in a politically divided state. DENVER (AP) — Former Colorado Gov. John Hickenlooper said on Monday he’s running for president, casting himself as a can-do uniter who’s used to overcoming adversity and accomplishing liberal goals in a politically divided state. He becomes the second governor to enter the sprawling field, after Washington Gov. Jay Inslee announced last week, and is trying to cast himself as a pragmatist who can also take on President Donald Trump. Though as governor Hickenlooper prided himself for staying above partisan fights, he has argued his record as a former governor and big-city mayor distinguishes him from a broad field of Democratic presidential aspirants who are backing ambitious liberal plans on health care, taxes and the climate. Hickenlooper has hedged on supporting Democratic rallying cries like Medicare for All and the Green New Deal to combat climate change. He once worked as a geologist for a petroleum company and was roundly criticized for telling a congressional panel he drank fracking fluid while arguing for the safety of the energy extraction technique. It was after Hickenlooper was laid off from his geologist position during the energy bust of the 1980s that he inadvertently started on his road to politics. He opened a brewpub in a then-desolate stretch of downtown Denver that unexpectedly took off. That enabled Hickenlooper to become wealthy by building a mini-empire of restaurants and bars. It also led to him making a quixotic run for Denver mayor in 1993. Campaign ads featured Hickenlooper feeding quarters into parking meters to protest the city’s charging for Sunday parking downtown. He won handily. As mayor, Hickenlooper helped persuade dozens of suburban cities, sometimes led by Republicans, to back a tax hike to fund a light-rail network. He was filmed diving out of an airplane to advocate for a statewide ballot measure to suspend an anti-tax measure passed in the 1990s and allow the state budget to grow. When he ran for governor in 2010, he featured an ad of himself fully dressed, walking into a shower to scrub off negative attacks. It’s all part of Hickenlooper’s quirky political image — he vows not to run attack ads and has frequently made fun of his tendency to misspeak and wander off political message. Hickenlooper was supported by some Republicans as governor. His first term was marked by a series of disasters and tragedies, some of which he alluded to in his launch video — record wildfires and floods, the assassination of his own prison chief by a member of a white supremacist prison gang and the 2012 Aurora theater shooting, which killed 12. After that attack and the Sandy Hook Elementary School shooting massacre in Connecticut months later, Hickenlooper called for gun control legislation and signed bills requiring universal background checks and limiting magazine capacity to 15 rounds. Hickenlooper backed civil unions for gay couples and signed a law providing them in Colorado in 2013, before the U.S. Supreme Court legalized gay marriage. He announced in 2013 that he opposed the death penalty and refused to execute a quadruple-murderer who was on death row. And, as he prepared to leave office and was openly mulling a presidential bid, he ordered the state to adopt California’s low-emission vehicle standards to fight climate change. 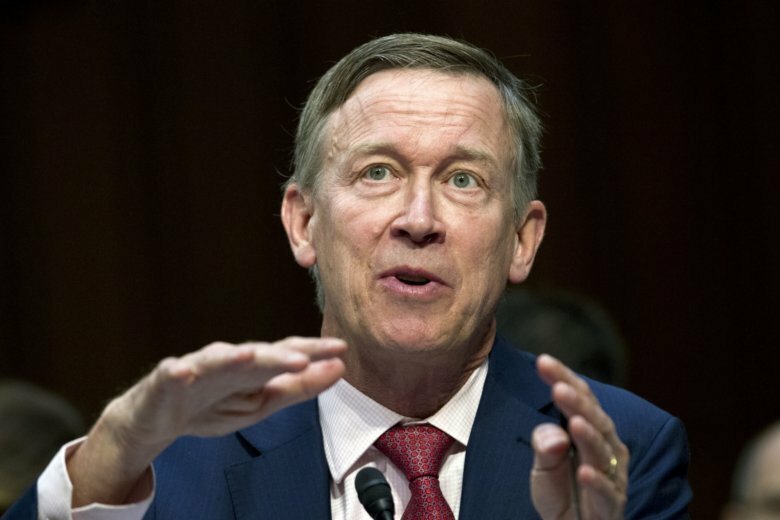 The last move was widely seen as shoring up an area that has long created tension for Hickenlooper — his relationship with the energy industry. Groups opposed to the expansion of energy exploration into Denver’s suburbs often complained that Hickenlooper was too close to the oil and gas business, which remains a powerful force in Colorado politics. As governor, Hickenlooper opposed ballot measures to limit drilling in populated areas. Hickenlooper’s successor, Democratic Gov. Jared Polis, has been more critical of the industry. Last week, Polis announced he’d pursue a wide range of new policies that would limit energy exploration. Another potential vulnerability for Hickenlooper is money. As a former governor, he can’t recycle donations from prior campaigns into a presidential account, as can the many U.S. Senators in the field. Hickenlooper’s political committee raised $1 million during the first two months of the year, in contrast to senators such as Kamala Harris of California, Amy Klobuchar of Minnesota and Bernie Sanders of Vermont, who raised more than that amount in the 24 hours after they announced their campaigns. Hickenlooper responded by rattling off his governing accomplishments. This story has been corrected to show Hickenlooper is 67, not 66.